Death of Helena, 1st Christian Archaeologist. A character in a nursery rhyme may be closely connected with Church history and Christian archaeology. Probably you have sung “Old King Cole was a merry old soul.” But did you know that the British have an ancient tradition that Helena, the fourth-century Christian archaeologist was the daughter of King Coel of Colchester, immortalized in thisMother Goose rhyme?If this story is true, another interesting fact follows from it. Helena was the mother of Constantine, the first christianized Emperor of the Roman Empire. This means Emperor Constantine was the grandson of a Mother Goose hero! Since there actually was a Christian church at Colchester in 250 A.D.–about the time that Helena was born–it is possible that she become a Christian as a young person which would explain Constantine’s interest in the faith. However, so much of Helena’s life is obscure or unknown, including the date and place of her birth, that we cannot make the connection with any certainty. Some historians theorize that since the emperor Constantine later named a town in Asia Minor Helenopolis in her honor, she was born there, not in Britain, and was the daughter of an innkeeper. Unclear too is when and where Helena met the Roman soldier Constantius Chlorus, or even if the two were ever officially married. What is certain is that Constantius and Helena were Constantine’s parents. When Constantius became Caesar of Gaul, Spain, and Britain in 292, he dumped Helena in order to marry Theodora, daughter of his patron, the emperor Maximian. It was a cold-blooded political move designed to advance Constantius’ career. Helena’s son Constantine spent much time at the court of the emperor Diocletian and became a soldier like his father. When his troops later proclaimed Constantine emperor in 306, one of his first acts was to recall his mother from the political exile she had been in ever since her divorce and give her honors befitting the mother of a Roman Emperor. When Constantine embraced Christianity, Helena gave him her strong support and encouragement. Eighty year old Helena became so enthusiastic about the faith that she traveled to the Holy Land. Her mission was about more than mere curiosity, for as she traveled through the eastern imperial provinces, she encouraged the establishment of the Christian faith. Once in Palestine she sought out the original locations associated with the life of Jesus, becoming the first known Christian archaeologist. Helena then oversaw the construction of several churches Constantine had ordered built in Bethlehem, Calvary, Olivet, and Bethany at sites associated with Christ’s life. A pagan temple to Aphrodite had been built on the tomb site of Jesus’ resurrection; it was torn down and replaced by the Church of the Holy Sepulcher. Later legends arose that Helena also discovered the actual cross of Christ in the tomb beneath the church. 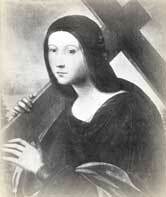 In paintings she is often shown as a young and beautiful woman holding this cross. Helena’s tour became a pattern for Christian pilgrims throughout the Middle Ages. Even today, at Christmas time “Manger Square” in Bethlehem is thronged with pilgrims coming to worship at the Church of the Nativity and at Easter, Christians follow the Via Dolorosa (Way of Sorrow) to the Church of the Holy Sepulcher in Jerusalem. Both of these ancient churches in the Holy Land are connected with Empress Helena. When Helena died on this day, August 18, 328, she was buried in the Church of the Holy Apostles in Constantinople. Bell, Mrs. Arthur. Saints in Christian Art. London: George Bell, 1901 – 1904. Butler, Alban. Lives of the Saints. Various editions available. Christian History Institute. Glimpses. Issue #73: Helena, First Christian Archaeologist. Kirsch, J.P. “St. Helena.” The Catholic Encyclopedia. New York: Robert Appleton, 1914. “Helena, St.” The Oxford Dictionary of the Christian Church. Edited by F. L. Cross and E. A. Livingstone. (Oxford, 1997). Waugh, Evelyn. “St. Helena, Empress;” from Saints for Now, edited by Clare Booth Luce. Sheed & Ward, 1952.